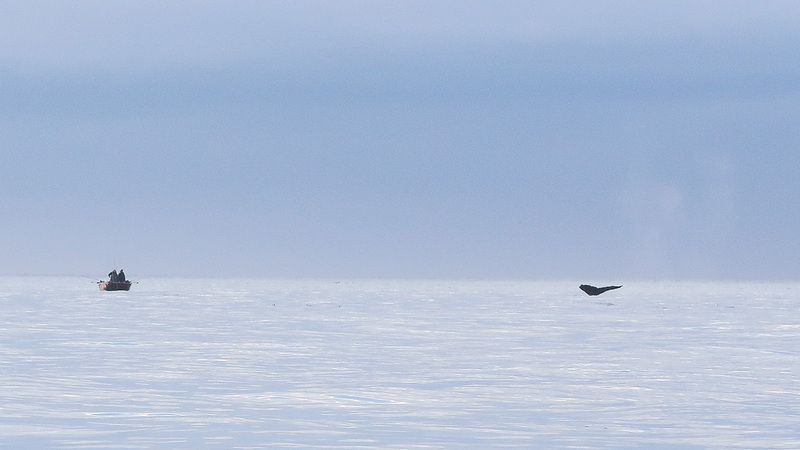 Today saw a mix of light variable winds which allowed QCL guests and guides to fish all corners and everywhere in between on all of our fishing grounds, both inshore and offshore. Chinook fishing close in to the kelp and rock structure is still producing results but at a slower pace. 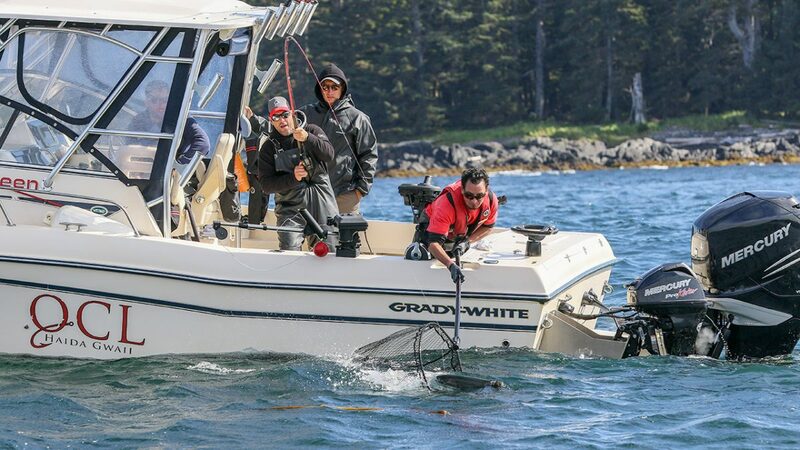 With patience and willingness to stay at one spot, most anglers will be rewarded when the bite finally does turn on. Get your lines back in the water as quickly as you can though and try to hook up again because these are mostly snap bites, lasting only a short period and you may have a chance at only a couple of fish at a time. 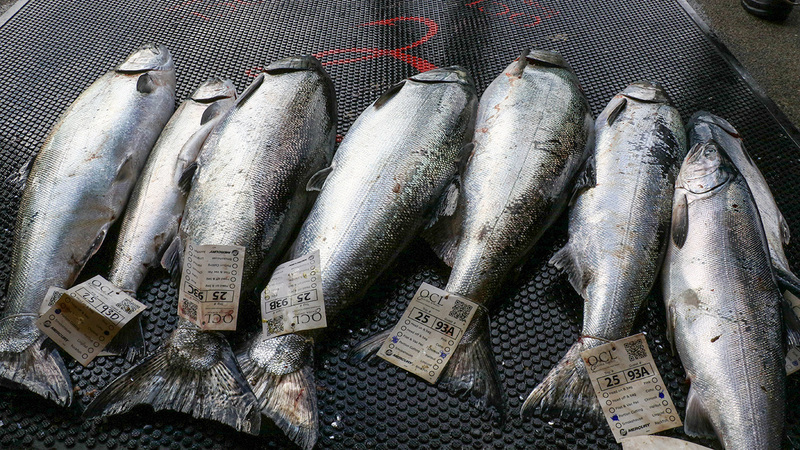 The bonus though is that the average size of these Chinook are larger than the average size from earlier in the year with a chance at a fish of a lifetime. 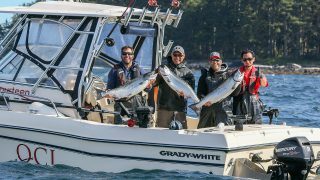 Coho fishing offshore is still producing results in the 160 to 300 foot lines while still trolling fairly shallow. It was changeover day and with my new guests for the trip aboard Grady 114 we headed out to the fishing grounds. The water was in great condition and the starting options were endless. With only a few boats at Cape Naden we dropped in and set the gear. Over the radio I heard of a few caught here before we arrived and was hoping we could still cash in on the bite. After a couple of passes without a touch and without seeing any other boat hookup I was starting to think we missed our chance at the early afternoon bite. After an hour and thinking about a potential move, possibly offshore to find some Coho, the port rod goes off. With two big heavy slams of the rod tip the down rigger clip pops and line starts peeling. We’re off to the races boys! My guest carefully picked up the rod and let the fish continue to head for Alaska. Quickly we got to a point where I had to start reversing to chase this fish down. The tension on the drag was set just right and there didn’t seem to be any slow down at all. A bit faster on the chase and finally the line slowed down but was still creeping off the reel. This is a good one guys, don’t start reeling until this fish stops taking line! With well over half of the spool of line being pulled out to the open ocean my Islander finally stopped letting out line. I watched the rod tip as my guest was about to start reeling when one big head shake pulled the rod tip down and the the line went limp. Heartbreaking. Potential fish of a lifetime?? Who knows. Didn’t see it once. Will never know. But it was fun while it lasted. We re-grouped, carried on and shared a high five over the one that got away. Makes for a good fishing story anyways. Keep your tip up, line tight and hang on for the ride.